Summer is wedding season... everyone knows that. However, every wedding is different and there are many different dress codes. Not sure what to wear? No worries! I am here to help. 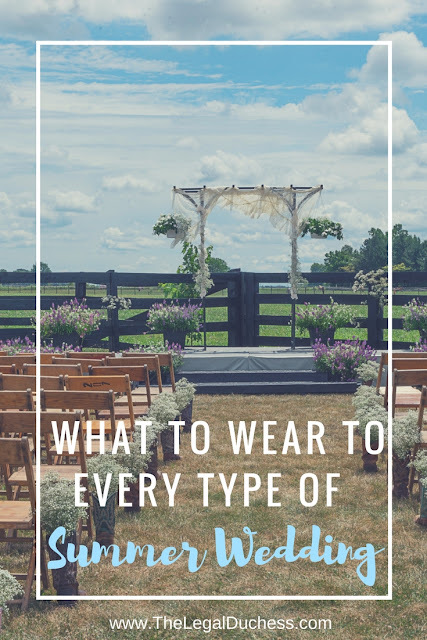 I have partnered with Bonobos fashion to provide a guide of what to wear for every variety of summer wedding. Bonobos is a classic fashion destination for men so check it out to get your wedding date/boyfriend/fiance/husband dressed to impress and within the dress code for every type of summer wedding. They offer every kind of men's attire and it is all very stylish and quality. Some weddings will be marked as formal attire only or black tie. This means time to get fancy! It's basically adult prom time... with alcohol. I prefer to wear darker shades to a formal wedding. Personally, I see no problem wearing black to a wedding as it is the most classic color and very flattering. However, navy blue can give the same effect without being quite so black. Not quite a black tie wedding but the people getting married want you looking classy. Don't go crazy but look exceptionally classy. Channel your inner Duchess Kate. Classic colors, modest necklines and knee length is the way to go. Casual weddings are the bomb. They don't care what you wear they just want you to have fun. Dress nice but no need to break out the Spanx and skin tight cocktail dresses for these weddings. Just bring your dancing shoes! I like to wear brighter colors to a casual wedding. Three words- bring your sunscreen!! I have gotten so sunburnt at outdoor weddings in the past. Also, bring along the sunglasses so you can see the bride and groom without squinting. Wear light colors (no black!) to help beat the heat; I prefer pastels. Outdoor weddings are super fun so long as you dress appropriately. Enjoy the summer wedding season! Eat cake, celebrate love and dance your booty off! Thank you Bonobos for partnering on this post! Make sure to send your men there to do their wedding attire shopping!